*Data taken from official FCCLA website on 3/22/2013. FCCLA Graduation Cords in Red and White compared to Honors Graduation's Red and White cords show how you can save money for your student group! Double cords are comprised of a red honor cord and a white honor cord tied together in the center to make one double cord. 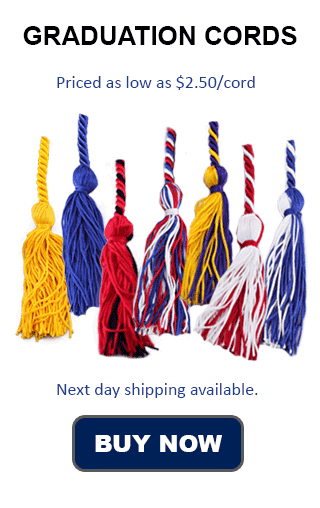 We offer same day shipping for our red and white double honor cords along with a speedy and easy to use checkout process and a variety of delivery options. Our Red and White Honor Cords Also come with 4 inch red and white tassels on each end of the ropes. To save even more, choose our single cords with braided red and white strands. The colors of honor cords are often seen as symbolic. Red symbolizes determination, strength, and courage. For these reasons, it is frequently used as a symbolic color on national flags. These are qualities that lead to internal and lasting happiness and a positive image of one's self. White stands for sincerity in purpose and integrity in actions, and is also a very common color for nations as well as organizations worldwide. These are qualities that will help build a better future through better individuals. There are many social and academic organizations geared towards students in which students can participate to have a more full experience, regardless of the point that a student is at in his or her studies. High schools, junior highs, and colleges all have these societies. Check out the options you have available to you, you may be surprised!